Bearing in mind the distinctly frosty nature of the film under review, this article will be preceded by a seasonally-sensitive message of caution. Warning: this film contains extremely non-fluffy material that could cause an inflammation of emotions (or, as they are now commonly known – “feels”); the proper representation of which would not be accurately captured by even the most potent “sad-face” emoji. The surly-man’s tonic to this month’s other big release (some flim-flam, musicy-dancey flick whose name is too silly to merit typing), Manchester By The Sea is the new film by writer / director Kenneth Lonergan. It tells the story of Lee Chandler, played impeccably by the immense Casey Affleck. Lee is a reclusive and tormented Boston janitor who seems to have all but retired from the social sect of his surroundings. Early in the film Lee is told that his brother has died and that he has been made the lawful guardian of his teenage nephew Patrick – also played brilliantly by young star Lucas Hedges. Lee’s staunch reluctance to move back to his hometown belies a life-altering tragedy that is subsequently revealed in the form of Lee’s memories of his lost family-life. It soon becomes apparent that the tragic incident that precipitated this loss is the cause of all of Lee’s brooding grief and sporadic outbursts of aggression. The flashbacks to Lee’s former life are intertwined wonderfully with the main narrative of the film – adding as it does depth and context to the story unfolding on the screen. These flashbacks also give two highly contrasting portraits of Lee, who has become completely transformed from the joyful family man he once was. Affleck is mesmerising as the grief-stricken protagonist; portraying with devastating effect the torments of a man torn apart by sadness and regret. He manages this with the most subtle gestures; be it in the sorry collapse of a vacant stare, the droop of his shoulders, the crack and stutter of his voice or the tangible frostiness of his demeanour – a frostiness that is reflected in the winter-landscape of the film’s setting. On a not-too-brief side note: Surely this performance, along with his portrayal of the coward Robert Ford in The Assassination of Jesse James, finally proves that Casey, despite the numerous plaudits regularly lauded upon his overrated, over-rewarded, over-acting older brother, is by far the more talented of the two Afflecks. 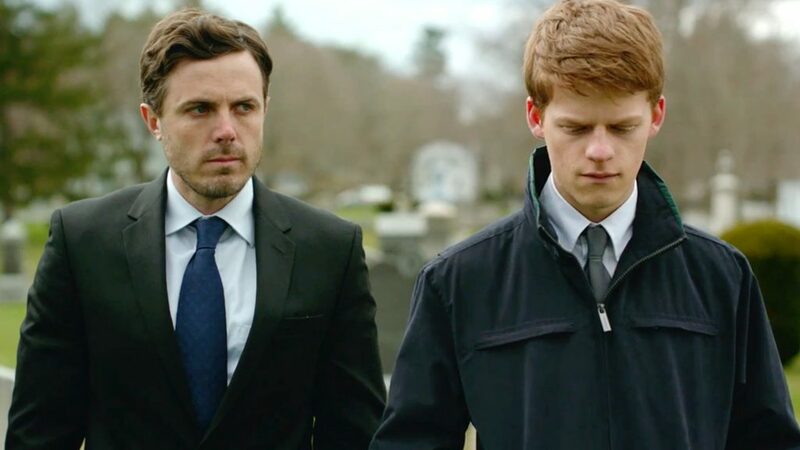 The success or failure of Manchester By The Sea lies squarely on Affleck’s perennially hunched shoulders, and he pulls off the challenge with esteem. This film is not all doom and gloom however. The dialogue has many small, ironic laughs peppered throughout – subtly hidden in the sardonic but lovingly warm exchanges between Lee and his new ward Patrick. It is a humour that recognises and laughs at the dark content of the film; and in this sense it both defies and instils the tragic circumstances of the story. The chronic detachment of Lee is eventually softened through the connections that he rediscovers in his old home; but the conclusion of the film offers only a glimmer of cathartic resolution. The only criticism, and it is one shared by many, is that the story of Lee’s wife (played by Michelle Williams) is not dealt with in any comprehensive way; but in saying that, the scene where the formerly married couple reacquaint themselves is one of the most powerful in the entire film. Anyone still suffering from the January blues will probably figure that the much lighter La La Land is just the feel-good potion they need in order to forget their new-year woes; but I would persuade anyone blessed with a hardier constitution to go see Lonergan’s alternative, intense and remarkably compelling film.